The accurate interpretation of infrared spectra of organic structures is an extremely important tool for the analytical chemist. Using up-to-date source material, this volume presents a compilation of the infrared absorption regions of ninety of the most important organic molecular fragments. This highly practical guide introduces the reader to a straightforward technique for determining all the fundamental vibrations of a molecular fragment. The set of normal vibrations and the infrared absorption regions of ninety molecular fragments are then discussed and tabulated. The discussion of each fragment is accompanied by a large number of references. A Guide to the Complete Interpretation of Infrared Spectra of Organic Structures offers the analytical chemist the possibility of a more profound interpretation of infrared spectra. In addition, it assumes only a basic knowledge of infrared spectra, and so will prove very useful for non-specialists who use infrared spectroscopy in analysis. Noël P.G. 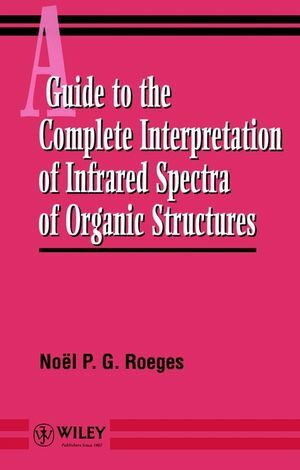 Roeges is the author of A Guide to the Complete Interpretation of Infrared Spectral of Organic Structures, published by Wiley. Normal Vibrations and Absorption Regions of CX3. Normal Vibrations and Absorption Regions of CH2X. Normal Vibrations and Absorption Regions of CHX2. Normal Vibrations and Absorption Regions of CHX. Normal Vibrations and Absorption Regions of CX2. Normal Vibrations and Absorption Regions of C(=X)Y. Normal Vibrations and Absorption Regions of Alkenes andAlkynes. Normal Vibrations and Absorption Regions of NitrogenCompounds. Normal Vibrations and Absorption Regions of Oxy Compounds. Normal Vibrations and Absorption Regions of Sulfur Compounds. Normal Vibrations and Absorption Regions of Ring Structures.